Na-qoy-qatsi: (nah koy’ kahtsee) N. From the Hopi Language. <eachother-kill many-life> 1. A life of killing each other. 2. War as a way of life. 3. (Interpreted) Civilized violence. A motion picture experience beyond words, Naqoyqatsi merges the power of image and music to plunge into the heart of the hyper-accelerated, globally wired 21st century. Mesmerizing images plucked from everyday reality, then visually altered with state-of-the-art digital techniques, stream across the screen in synch with a hypnotic score by Philip Glass, featuring the passionate cello work of Yo-Yo Ma. Despite the film’s nonverbal nature, the ultimate effect of its starkly futuristic, computer-enhanced visual fabric is to get people talking about how technology is altering everything: media, art, entertainment, sports, politics, medicine, warfare, ethics, nature, culture and the very face of the human future. Nearly every image in Naqoyqatsi is a special visual effect. Some 80 percent of the film’s footage is culled from stock footage (from such sources as scientific and military films, newsreels, corporate videos, sports documentaries, cartoons, television shows and commercials), most of which has been radically altered with digital technology. Images have been colorized or de-colorized, stretched, slowed or speeded up, re-patterned, re-textured and “re-animated,” turning the familiar into something startlingly new. By using the cutting edge in filmmaking technology, Naqoyqatsi provides a dizzying view of today’s world as seen through the lens of the very machinery that has created it. Naqoyqatsi is the third and final feature film in “The Qatsi Trilogy” which began with the groundbreaking Koyaanisqatsi, a revelatory, kaleidoscopic view of clashing urban and natural landscapes in North America, and continued with Powaqqatsi, a journey around the world unfolding primal traditions and the influx of new technology. The films have been described as cinematic “head trips” that take audiences into a realm of pure sensory experience. Together, they have also become a rare artistic chronicle of the turbulent transition between the 20th and 21st centuries and its as-yet-unseen consequences. 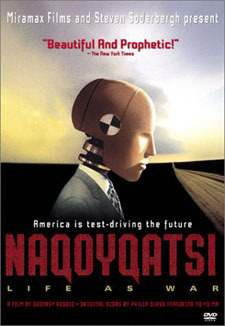 Naqoyqatsi now leaps ahead to capture the essence of globalization as barrier-breaking advances in robotics, quantization and digital communications spread like wildfire across the planet. This final part of the “Qatsi” series presents one man’s vision of what we are hurtling towards in a world where technology reigns: unprecedented extremes of promise, spectacle, tragedy and finally, hope. Like a concert, Naqoyqatsi unfolds in three movements. Movement One explores the newly wired world and the ongoing evolution from human language to numerical code. Movement Two delves into the realms of sports, competition and gaming, which have become worldwide addictions. Movement Three takes off on a journey into sheer speed and the breakneck acceleration of 21st century life — pondering what it is like to remember the future and truly experience the present. Naqoyqatsi is written and directed by Godfrey Reggio, with an original score by Philip Glass featuring cellist Yo-Yo Ma. Jon Kane is the editor and visual designer. The executive producer is Steven Soderbergh and the producers are Lawrence Taub and Joe Beirne. The co-producer is Mel Lawrence, and the director of photography is Russell Lee Fine. Writer and Director: Godfrey Reggio. Editor and Visual Designer: Jon Kane. Producers: Joe Beirne, Godfrey Reggio, Lawrence Taub. Music and Soundtrack Producer: Kurt Munkacsi. Executive Music Producer: Jim Keller. Image Research Director: Ray Hemenez. Dramaturgical / Editorial Continuity : Miroslav Janek. Director Of Qatsi Music / Sound Studio: Francis Kuipers. Dramaturgical Shaping: Philip Glass, Ray Hemenez, Miroslav Janek, Jon Kane, Francis Kuipers, Godfrey Reggio. First Assistant Editor: Karla P. Henwood. Visual Fx / Image Re-animation: Manuel Gaulot. Original CGI Animation: Manuel Gaulot, Cameron Hickey, Zachary David Medow. Image Assistant To Jon Kane: Bulent Bas. Qatsi Productions Coordinator: Lauren Feeney. Director Of Photography: Russell Lee Fine. Guest Cinematographer: John Bailey, A.S.C. Post Production Supervisor: Susan Lazarus. Conforming Editors: David Abelson, Karla P. Henwood. Film Research: Lewanne Jones, Andrew Noren. Title Linguistic Research: Ekkehart Malotki. Image Assistant to the Director: Marion Wasserman. Assistant to Qatsi Music / Sound Studio Director: Nathaniel Reichman. Project Realization: Karen Hopkins, John Rockwell, Ty Burr, Pat Dollard, Mayra Langdon Riesman, Rick Wysocki. Production Accountant: Judy Haas Kiphart. Assistants to Lawrence Taub: Rhonda Avidon, Lesley North. Legal Counsel: David G. Lubell, Jeff Jaffe. Sound Studio Assistant: Patrick Inverso. Apprentice Picture Editor: Harold Lee Yen. Rotoscoping and Image Preparation: Benjamin Fine, Lauren Feeney. Studio Kitchen: Brian O’Leary, Jasmine Lee, Mikako Niino. Studio Feng Shui: Marti Lovell. Second Unit Director: Jon Kane. Production Managers: Christine Mcandrews, Sophia Lin. Real People Services: Caroline Sinclair. First Assistant Camera Operators: John Clemens, John Mcaleer, Jr., James R. Belletier, Chris Bottoms. Second Assistant Camera Operators: Daniel Keck, Kathleen Corgan, Jason Vandermer. Photosonics Technicians: Don Cornett, Anthony Pisciotta. Gaffer: Jon Hokanson, Robert Omer. Best Boy Electric: Donald Peifer, Nicole Corre. Electric: Haroun Ibn-mock, Kira Kelly. Key Grip: Jon Mintz. Grips: Jesse Cory, Chris Dino, Heidi Grunwald, Sam Kretschmer, Timothy Reilly, Tim Spellman, Matthew Witgenstein. Sound Services: Nathaniel Reichman, Patrick Inverso. Prop Assistants: Bert Cooper, Kenny Urbina, Jesse Levin. Production Coordinators: Meryl Stavitz, Jeffrey Brown. Second Assistant Director: Annie Tan. Production Assistants: Boris Cifuentes, Sam French, Christopher Guice, Keith Jacoby, Matthew Jarrett, Justin Lehman, Michael Owen, Elizabeth Rohrbaugh, Sam Taub, Jan-luc Van Damme, Kristopher Walter. Location Food Services: Il Buco Restaurant, Donna Lennard, Alberto Avalle. Additional Production Services: Decal Pictures, Inc.
First Assistant Camera: Michael Dzialowski. Second Assistant Camera: William Eichler. Best Boy Electric: Ralph Bickford. Grips: Jim Rogers, Dan Richard Ahearn. Production Assistants: Thomas Smith, Lawrence Ketchum, James Brown, Laura Palazzo. Image as Location / Re-animation Footage Provided by Getty Images and its Collections Of Archive Films and Image Bank Film, ABCNEWS VideoSource, Sekani, Inc., BBC Worldwide Americas, Inc., Anatomical Travelogue, Inc., Kratky Film Praha a.s., Millisecond Cinematography, Peter Lang, Motorola Inc., I-D Media, Artbeats Digital Film Library, International Cinema, Inc., Blausen Medical Communications, Inc., Grinberg Worldwide Images, Nissan and the Nissan logo are registered trademarks of Nissan. “Eadweard Muybridge: Motion Studies”: A Joint Project of James Sheldon and Addison Gallery Of American Art, Phillips Academy. “The Tower of Babel” by Pieter Bruegel the Elder (1526-1569), Museum Boijmans Van Beuningen, Rotterdam. Thermal Videography Consultant: Edward Kochanek – Flir Systems. Thermal Photography Consultant: Frank Bryson. Production Interns: Julie Bruins, Jaki Levy, Sarah Roth, Collin Ruffino, Victoria Moy. Musicians: Members Of The Philip Glass Ensemble: Soprano Voice: Lisa Bielawa. Soprano Saxophone: Jon Gibson. Tenor Saxophone: Richard Peck. Flute, Piccolo, Clarinet: Andrew Sterman. Keyboards: Michael Riesman, Eleanor Sandresky. Live Sound Mixer: Dan Dryden. Featured Guests: Bass Voice: Al de Ruiter. Didgeridoo: Mark Atkins. Mezzo-soprano: Alexandra Montano. Members of the Orchestra: First Violin: Timothy Baker. Violins: Anahid Ajemian, Leszek Barnat, Joyce Hammann, Regis Iandiorio, Julianne Klopotic, Leonid Levin, Nancy Mcalhany, Jan Mullen, Linda Quan, Marti Sweet. Violas: Masako Yanagita, Alfred Brown, Stephanie Fricker-Baer, Jill Jaffe, Lois Martin, Linda Moss. Cellos: David Calhoun, Marisol Espada, Semyon Fridman, Gregory Hesselink, Richard Locker. Double Basses: Joseph Bongiorno, Gail Kruvand-Moye. Woodwinds: Flute & Piccolo: David Wechsler, Timothy Malosh. Oboe & English Horn: Shelley Woodworth. English Horn: Melanie Carp. Clarinet: John Moses. Bass Clarinet: Virgil Blackwell. Bassoon: Frank Morelli. Brass: French Horn: Sharon Moe, Peter Gordon, Ronald Sell. Trumpet: Lorraine Cohen, Francis Bonny, William Rohdin. Trombone: James Pugh, Dan Levine, Keith O’Quinn, Dean Plank. Bass Trombone: Alan Raph. Tuba: Andrew Rodgers. Percussion: Frank Cassara, Sean Mccaul. Keyboards: Nico Muhly. Harp: Susan Jolles. Vocals: Tenor: Tony Boutté. Baritone: Paul Houghtaling. Recorded at the Looking Glass Studios, New York. Assistant Engineers: Mario McNulty, Christian Rutledge. Additional Recording: Futura Productions, Boston. Engineer: John Weston. Technical Consultant: Monte McGuire. Music Production Administration: Kara Bilof. Assistants to Mr. Glass & Mr. Riesman: Nico Muhly, Max Giteck Duykers. Interns: Dawn Landes, Matt Gill, Dan Bora. Thanks to: Linda Brumbach, Tim O’Donnell, Cristin Bagnall, Ramona Kirschenman, Cat Celebrezze, Rachel Grundfast and the staff at the Looking Glass Studios. Philip Glass Publishing and Management: Dunvagen Music Publishers, Inc. ASCAP. Soundtrack Album Produced by Kurt Munkacsi. Sound Mixed at Sound One Corp., New York. Re-recordist: Harry Higgins. Engineering Support: Avi Laniado, Bob Troeller, Rocky Tortorella. Optical Track Recording: Parviz Firoozeh. Thanks to: Jim Gardner, Jay Rubin and The Crew At Sound One. Dolby Sound Consultant: Steve F. B. Smith. Sound Editorial Services Provided by Skywalker Sound, a Division of Lucas Digital Ltd., Marin County, California. Assistant Sound Designer: Noah Katz. Avid Symphony Systems: Orbit Digital, New York, Alastair Binks, Eric Zeller, Booth Kenney, Pete Conlin, Neil Girardi, Olivier Girard, Katie Storino, Darcey Robinson, Orbit Digital, LA, Tom Stevens. Additional Animation: Gary Leib / John Kuromoto, Twinkle, Tom Tafuto, Matt Stauss, Applied Imagination Inc., Jeremy Lasky, Perception, Maison Mère, Big Film Design. Advanced Temporal Engineering: Alan Swartz. Digital Intermediate Post Production Services: Tape House Advanced Imaging Center, Tape House Digital Film. Colorists: Joe Gawler, John Dowdell, John Crowley. Assistant Colorists: Tibor Kereszturi, Jeanette Correa. IQ Data / Online Editor: Peter Heady. Data Transfers: Bob Huszar. Supervisor HD / Data Services: Tim Spitzer. Laser Film Recording: Tape House Digital Film, NY. Technical Directors: Christian Zak, Charles Kouzoujian. Producer: Alfie Schloss. Assistant Film Editor: Misako Shimizu. TeraNex 1080/24 Conversions: Viacom Video Services, New York. Special VFX Software: Paul Miller / Profound Effects, Marco Paolino / Digital Film Tools, Andre Brunger / 3Prong, Wes Plate / Automatic Duck, Tim Wilson / Artel Software, Karl Sims / GenArts Software. Negative Cutter: Stan Szaba / Match Cut. Production Facility: Qatsi Studios, NY. Facility Design: Exploded Diagram, LLC. Ernst & Associates Architects: James Everitt, Sheldon Simms. Projection Consultant: Dennis Earl Moore. Arriflex Camera: Camera Service Center, NY. Equipment & Service Providers: Omni Fitness, Jean Claude Francois. Main Title Animation: Manuel Gaulot. Trilogy Logo Design: Paul Pascarella. End Credits: John Kuromoto. Color by: Technicolor, New York. Dailies Advisor: Joe Violante. Color Timer: Don Ciana. Prints: Tony Romano. Banking Services: First National Bank of Santa Fe ,Steve Stork, Mark French, JP Morgan Chase Bank, New York, Bill Saya. Insurance Provided by: Taylor & Taylor Associates, Inc., Elizabeth Carulli Weiner. Locations: Michigan Central Railway Depot, Detroit Control Terminals, Inc., The Cathedral School of St. John The Divine, NY, AT&T Switching Center, NY, Us Military Academy at West Point, NY US Department of the Army, Madame Tussaud’s New York, Greenpoint Terminal, Brooklyn. Thanks to the Mayor’s Office of Filmtheatre and Broadcasting New York City. Technical Advisors: Jacques Vitte, David Tecson, Wilson Chao, Michael Pollak Jeff Kreines, Matt Walsh, Jonathan Porath, Yekaterina Gratznovska, G.B.B. Avid Technology: Michael Phillips, Steve Bayes, Randy Fayan, David Frasco, Opticnerve USA, Inc. Continuing Thanks: George Lucas, Francis Ford Coppola, Dan Noyes, Ron Fricke, Tom Luddy, Rick McCallum, Bill & Stella Pence. Dedicated to: Tony Price, Walter Chappell, Gregory Corso. Project Facilitators: Mickey Blashfield, Jennifer Burak, Cybele Carpenter, Massimo Cortesi, Jonathan Chodosh, Dale Dobson, Kathelin Gray, Robert Greenberg, Jene Highstein, Tanya Ivchenko, Davian Littlefield, Davide Lombardi, Joe Marrone, Paola Melli, Christopher M. Miller, George Meyer, Angela Melitopulos, Thomas MÜller, Annie Ohayon, David Padwa, Robert Palmer, Gianfilippo Pedote, Anthony Perrone, Ken Richards, Fausto Sarmiento, Michiel Schwarz, Ritsaert Ten Cate, Doug Tompkins, Rose Cohen, Ron Yerxa, Andrey & Natasha, Dementiev, Ron & Amy, Gutman, Djordje & Betsy Milic’Evic’, Andrew & Gay Ungerleider. Inspiration: Ivan Illich, Jacques Ellul, David Monongye, La Gente / YCFA. This Motion Picture Was Created by Qatsi Productions, LLC and Miramax Film Corp. Copyright ©2002 Qatsi Productions, LLC and Miramax Film Corp.